I’m always looking for my “pot of gold” people. They have hearts of gold and an abundance of wisdom they use to help seniors in a specific way. People like your aging parent. Gale Wald, RN, is one of those persons. Holidays are especially busy for her, but she works hard all year long. Besides being a nurse for 25 years, Gale is a flight attendant with 10 years of experience. The combination of skills she has honed in those professions makes for one gifted person. Gale makes flying easier for vulnerable adults and their families. Her business is called Senior Transitions. 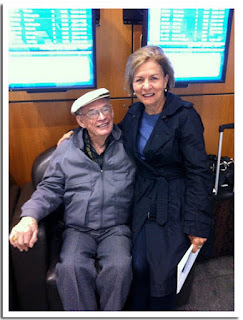 Does your aging parent or loved one want or need to travel by air but can’t safely fly alone? Gale can help. Or perhaps they can fly alone but need to be picked up at a distant location and delivered to you? If your schedule makes those situations difficult, Gale can assist you. · Provide a professional and trusted air travel companion. · Provide door-to-door ground transportation if needed. · Meet and greet you at the departure airport. · Guide the traveler through check-in, security and customs. · Assist with purchasing meals before, during and after a flight. · Handle the situation when scheduled flights are changed or canceled. · Keep family informed of departures and arrivals. Gale started her business 12 years ago when her friend’s elderly dad wanted to visit his sister in Seattle. He lived in Calgary, Alberta, and because of the distance and his frailty, he hadn’t been able to make a flight. Gale stepped in, and has been reuniting families ever since. Gale also does adult family home care assessments. For more information, contact Gale Wald at 206-755-3636 or stransitions@gmail.com. 1. Are for profit retirement communities more profitable than nonprofits? Not necessarily. There are for-profit senior communities that are weak financially and others that are strong. The same goes for not-for-profits. There's an old saying that rings true when it comes to nonprofits: "No margin, no mission." Financial stability is crucial for both groups to serve their residents and communities well. 2. What does each group (nonprofit and for-profit) do with profits they make from their organization? For-profits pay their investors and owners, both at the building level and at the corporate level. Non-profits must be socially accountable, investing in programs which will benefit those they directly service and the community at large. Many nonprofit senior communities set aside monies for a benevolence fund for elders who run out of money. Other nonprofits offer specialized training and scholarships to their employees. Still others sponsor volunteer programs to reach out to those in need in the community. 3. Are nonprofit retirement always faith-based (sponsored by churches)? Many are church affiliated, but others are connected with lodges, hospitals or charitable foundations. They are governed by volunteer boards, generally composed of people with expertise in a variety of fields which will be helpful to the community. 4. How do charitable contributions help the nonprofits? Individuals are able to give money to the retirement community, usually through a foundation or department of development. They can deduct these contributions from their taxes. In addition, in many states, nonprofit retirement communities are excerpt from a portion or all of the campus' property tax. 5. Are monthly fees more or less at for-profits than at their nonprofit counterparts? There are nonprofits offering affordable communities, and others that charge much more because of their luxurious lifestyle. The same is true for for-profits: varied price points, depending on their location and their prospective residents. I'm a blogger with two audiences. Most of you read because you have an elderly parent or loved one, and you're grappling with a particular issue. The rest of you read because you work in the senior care field. This post is for professionals. It's my opportunity to share some unsolicited advice, not because I relish doing so, but because it's needed. I've seen the need staring at me and others over the course of 20 years in the senior care field. As my minister father used to say from the pulpit: "I'm preaching this sermon as much for me as for you." My three-point sermon is directed at you, me, and all of us working with seniors and their families. 1. Be nice. Your clients may be crabby, unreasonable and once in awhile, outright mean. But we need to remember that they are the customer. We are not. And they may be facing one of the biggest challenges of their lives with an issue--or multiple issues--relating to their aging parent. Because of that stress, they may doff their usual persona and become Mother Bear or the Drill Sergeant. We, on the other hand, need to act like grownups, even when we're peopled out by the end of the day. Remember the old television show, Candid Camera? And the surprising line, "Smile, you're on candid camera?" Corny but true, a smile will do wonders for our customers, especially those who are hurting. 2. Speak the truth in love. Actually, those words are found in the Bible. Sometimes it's easy for us to withhold information which is needed but is hard to swallow. For example, in my line of work, I deal with children who think their parent will live in a spacious private room in a modern adult family home on Medicaid. But that's not the case. I need to empathize with their disappointment at the disparity between their ideal and reality. Another truth: If we don't have enough information to explain the "why's" of a particular situation, we need to educate ourselves or find someone more knowledgeable. 3. Say 'Yes' more than you say, 'No.' Sometimes "No" may be technically the right answer, but rephrasing the statement to emphasize the positive works better. Telling a resident, "No, you can't leave the community by yourself," may be true. But saying something like, "This is a good place for you to become healthier and stronger. We want you to stay for that reason," may work better. Let's face it. Learning the complexities of Medicaid is tough. If your parent is running out of money, you'll need to know the meaning of the following words. A little introduction. To be eligible for Medicaid, your aging parent has to qualify two ways: first, financially, and second, medically. Each state has its own program. The basic rules are similar, but dollar amounts on income and assets can vary. Most people these days in Washington State are applying for a Medicaid-waiver program called COPES (Community Options Program Entry System) which offers people care in their homes, in assisted living communities and in adult family homes. Traditional Medicaid refers to care offered in a skilled nursing facility. 1. Income cap--this is the limit on monthly income your parent can have and still qualify for COPES. In Washington State, the income cap is currently $ 6381. If your parent seeking COPES help is married, his or her income in their own name cannot exceed this amount. 2. Asset cap--in Washington State, and in many states, the limit for resources (assets, property and savings) is $2000 for a single person. In the case of a married couple in which one spouse applies for COPES, they can have $56.726. 3. Exempt resources--These are resources that don't count toward the $2000 limit. They can include a home (under certain conditions including when one spouse continues to live there when the other goes on COPES), household goods and personal affects, some real estate contracts, a car, life insurance with a face value of $1,500 or less, most burial plots and prepaid burial plans. 1. Comprehensive Assessment--a social worker will assess your parent's needs for help with such things as eating, bathing, transfer (e.g. moving from a bed to a chair), bed mobility (positioning), locomotion (walking and moving around), using the toilet and medication management. A person can run out of money and still not qualify for Medicaid if he or she is still independent or needs very little help. 2. Award letter--This letter is the official approval for COPES help. 3. Reimbursement rate--If your parent is applying for care in an assisted living community or adult family home, DSHS will set a daily rate that the State will pay for your parent's care. 4. Participation--This is the amount your parent will pay toward the cost of the care. Generally, a person "contributes" his income toward the care, minus a small amount for personal expenses. Much of the above is excerpted from a publication of Columbia Legal Services, Questions and Answers on the COPES PROGRAM. Judith A. Levy is an occupational therapist. For more than 40 years she has worked in geriatric care centers, hospitals and home-care programs. She has helped people of all ages get well. In 2013 she wrote a book, with another audience in mind: children of people with dementia. At the time Judith had been caring for her 97-year-old mother for nine years. Clinical knowledge was one thing. Having the responsibility of another life--that if her parent--was quite another. "I cannot go home at the end of the day and leave it all behind. Now I am the child, and this is my parent. I'm no longer the professional. I have no choice but to adjust to the changes." Judith's book, 'Activities to Do With Your Parent Who Has Alzheimer's Dementia,' has simple, meaningful activities that will stimulate the long-term memory and bring enjoyment to you and your parent. 1. Morning works best. People with dementia are mentally sharper then. As the day goes on and draws nearer to dusk, "sundowning" occurs, bringing with it increased confusion and agitation. 2. If the activity produces frustration, stop and move onto another one. 3. Do all the tasks at the same place each time. Choose a well lit table; make sure your parent's chair is comfortable. Spread out any "props" and clear the tabletop of other objects. The Alphabet--Using colored alphabet letters, sort the letters by color and count each group to see which color has the most letters. Other ideas: "The letter A is yellow; can you find it?" "Tell me a word starting with the letter A." And of course, sing the Alphabet Song. Baking--It's structured, sequential, time limited and satisfying. Baking can get your parent to talk about favorite foods, childhood holidays and an event in the past at which a special food was served. Depending on your parent's ability, he or she can help assemble ingredients, stir the batter, and wait for the timer to go off. Baking and decorating cupcakes are especially fun. Crossword Puzzles--Books in the grocery store have puzzles that may be doable if you work together. You can give clues that will help him or her succeed. A great book, with practical activities and conversation starters. If you care for an aging parent, you hope and pray things will turn out right. But sometimes, a curve ball comes your way and smacks you in the nose. Not literally, but it may feel that way. Some common scenarios: the assisted living you chose for your parent gives you a 30-day notice. Or you or your parent decides the community or the home care isn't living up to its promises. Or the rates go up so fast that you wish the stock market could keep up that same pace. Here are some ideas that might help you respond to the situation and find a solution. 1. If you receive a 30-day notice: "We can no longer meet your parent's care needs" is what an administrator or nurse may say. So you can ask, "What exactly are the issues that forced you to make this decision?" Probe some more. Is it socially inappropriate behavior? The need for more hands-on care than the facility can meet? And if so, what specifically can't the community do to keep your parent safe and well-cared for? If funds aren't limited, ask "Can we hire extra help to see if things work?" Obviously, extra help will cost you big; think hard before moving ahead. 2. If you decide the community isn't a good fit: Take some time to identify why your parent isn't happy. Is the building too big and the halls too imposing? If your parent's dementia causing him or her to isolate from others? Is the staff and administration lacking in compassion and/or expertise in working with elders? Sitting quietly (I know that can be hard when you are under stress) can give you perspective on why the situation isn't working. 3. If your parent's funds are running very low: It's easy to underestimate the amount of money needed for long-term care, especially as your parent's needs grow. The good news is that you may be able to find an assisted living community or adult family home that's considerably less expensive than what you're currently paying. A financial planner may help you get a handle on how much you can spend of your parent's funds monthly without going broke. Once you examine the causes of the problem, you can look for solutions that will work for you and your parent. Good luck. And remember that a bloody nose from being smacked with a baseball isn't the end of world. Mine happened in second grade. And I survived. All down the West Coast, and in other parts of the country, adult family homes dot the eldercare landscape. In Seattle and surrounding King County, there are 1100 such care homes. They're little known wonders. Two years ago I started knocking on the doors of adult family homes in my city. As I met the providers, observed the caregivers and spoke with the residents, I grew in my admiration for this homelike setting. I'd worked with seniors and their families for 18 years, but adult family homes were new to me. Since then, I've spoken with clients who have had the following questions about adult family homes. 1. Are caregivers in adult family homes adequately qualified? Caregivers in adult family homes must pass the same basic training classes as those working in assisted living communities. Those classes include coursework in dementia care, mental health and fundamentals of caregiving. 2. What is the staffing level in an adult family home? In Washington, the law requires at least one caregiver for six residents at all times. However, many if not most adult family homes have two or three caregivers working during the day, with one available at night. In assisted living communities, staffing levels are on average 12 residents to one caregiver. 3. Can adult family homes care for serious medical conditions? facility can handle, with a few exceptions including IV injections. 4. Do adult family homes have licensed nursing staff? Some homes are owned and managed by Registered Nurses. All adult family homes have Nurse Delegators. These are specially certified RN's who train the caregiving staff to do tasks that normally an RN does such as medication management, administering of creams and insulin injections. These Delegating Nurses are on call for the adult family homes to problem solve, consult with physicians, and assess residents' progress. 5. What type of resident is best suited for an adult family home? People who are considered "fall risks" because they've fallen several times are particularly suited for an adult family home. There are no long halls to navigate, and staff members can watch residents closely during the day. At night, if residents can't push a call button, staff can place a pad with a censor on the floor near the bed. If a resident starts to get up, the censor goes off quietly so the caregiver can hear and check in. People with dementia, especially mid to late stage, do well in adult family homes. The quiet atmosphere and caring staff can be soothing. 6. What elders might NOT be best cared for in an adult family home? Elders who are cognitively intact and physically able and who crave social activities are better served in assisted living. Do you have other questions about adult family homes? Eldercare Q-A: Mom has a new dementia diagnosis. Will she need memory care? Memory care. When someone is diagnosed with dementia, their family ponders the possibility of the need for such specialized care. Perhaps you're in that situation. The key is possibility. Not everyone with dementia needs specialized memory care. What triggers the need for memory care? Behaviors like screaming, striking out at others, and behaving inappropriately, such as using a waste basket for a toilet, all indicate a need for memory care. So does "exit seeking." That's a term for someone who impulsively and repeatedly heads for the outside door of his home or assisted living community. Another indicator of a need for memory care? People with dementia who can no longer feed themselves. There are others, but you get the idea. If your parent has just been diagnosed, he or she doesn't likely need memory care immediately. Often a smaller assisted living community may meet his or her needs during the early to moderate stages of the disease. Your parent can retreat to his or her apartment when the stimulation of the dining room and social activities gets to be too much. Caring staff can make his or her days go well. And if the disease progresses to the point of needing memory care, they should be able to tell you. In many assisted living communities nationwide, the memory care area is in the same building. Often residents begin in the regular assisted living section, and then move to memory care if and when the need arises. Another option for elders with moderate to severe memory issues is adult family homes. These may or may not be available in your parent's state. But if they are, they're a good alternative for many with dementia. There's a high staffing ratio, often one staff member for three residents, and the small setting allows caregivers to keep a watchful eye over residents who are at risk for falls. If your parent will need Medicaid funding, care options will likely be limited. Often adult family homes and nursing homes are the only Medicaid-funded choices for those with moderate to advanced dementia.